Evening Update: Today's high/low of 68°/48° yield a daily departure from average of 9°, and the monthly departure increases to +5.6°. 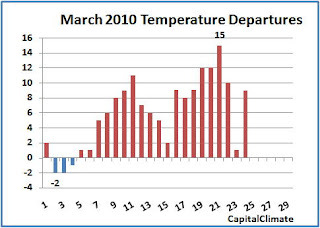 Added chart of daily departures for March. 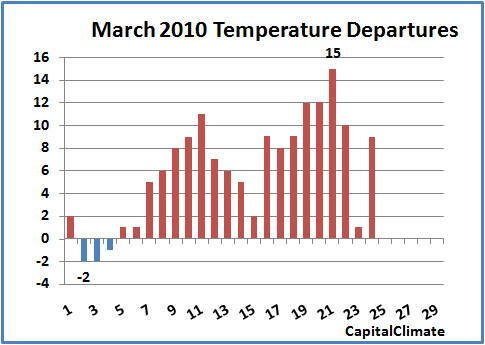 With a week left to go in the first month of meteorological spring, Washington, DC temperatures are averaging 5.5° above the long-term March average. 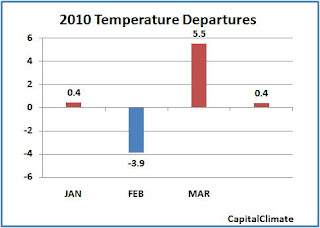 As noted earlier, winter temperatures averaged below normal mainly thanks to a cold February. However, the March warmth has more than compensated; combined with a slightly warm January, the year 2010 is averaging 0.4° above normal to date. Even with some cooler temperatures in the forecast, especially over the weekend, the yearly temperature is likely to remain above average through the end of March. The remainder of the month would have to be at least 4.3° below average for the final January-March mean to be below normal. As we celebrate today the 60th Anniversary of the World Meteorological Organization, I would like to pay tribute to the meteorological community worldwide working together continuously beyond all borders to save and protect people, their homes and their livelihoods. My recognition especially goes to all staff in the National Meteorological and Hydrological Services and all volunteers who support our work with generosity and dedication. 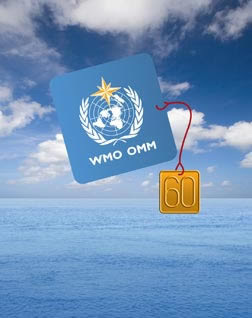 I am convinced that WMO, together with its Members, will be even more relevant in serving humanity over decades to come. We owe this capability to successive generations of meteorologists and hydrologists from all countries. To all of them, we express our gratitude. The WMO also published a booklet [pdf] reviewing the history and accomplishments of international meteorological cooperation.